Fancy a bit of pasta? 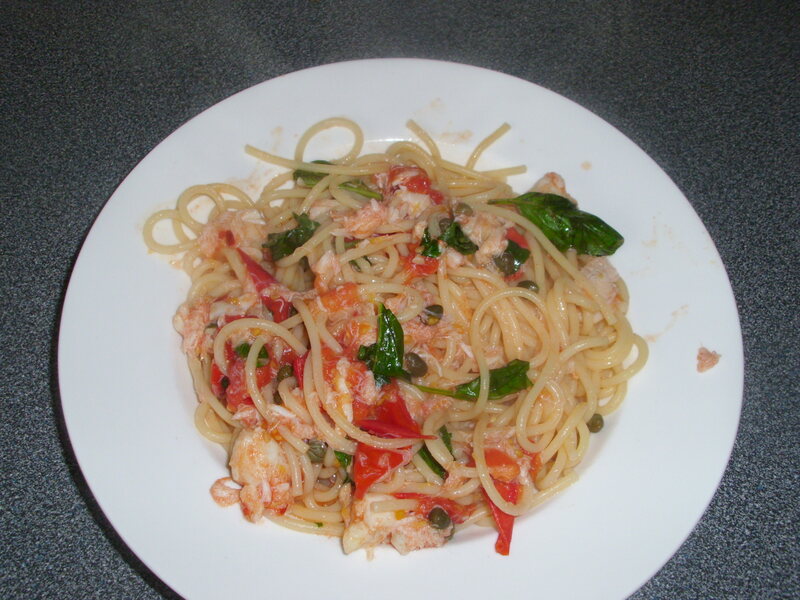 Spaghetti with crab, cherry tomatoes and basil. Yum!!! Today I’m cooking pasta and my favourite recipe at the moment is spaghetti with crab, cherry tomatoes and basil. You would not believe how easy or how delicious this meal is. I’m not a crab lover myself but absolutely love this recipe. It only takes about 25 minutes to prepare and cook so it’s almost faster than choosing and waiting for a take-away! Before you look at the recipe I thought you may be interested in a few facts about crabs. Did you know that there are about 85o different species of crab! The smallest one is a Pea Crab and is only a few millimetres wide. The largest one is a Japanese Spider Crab with a leg span of 4 metres, that’s 13 feet for those of us who are not yet metric lovers! Imagine meeting that when you go for a quick dip!!!! Crab meat is very low in calories and fat but a rich source of Omega 3 and vitamins and minerals, making it a perfect choice for a healthy heart or if you want to lose weight! A four-ounce portion of crab meat only has 98 calories and 2 grams of fat! This recipe only contains 349 calories per person. Excellent!! Can’t wait to eat it again! Uses tinned crab so no need to mess about cooking fresh crabs. I wouldn’t know where to start!